Drivers and trends of transportation in the Middle East. Over the last few decades, the Middle East and North Africa region witnessed rapid population growth, with its population swelling from 97 million in 1960 to 351 million in 2009. The region also witnessed a process of rapid urbanization during the same period. While only 30% of the region’s population lived in cities and towns in 1960 -compared to 32% globally- the urban proportion of the Middle East has almost doubled to 57% and exceeded the world average which currently stands at 50%. These trends have exerted great pressures on the transportation networks of the region’s cities and town, resulting in high traffic volumes and congestion. Policy responses to these pressures have typically been directed towards upgrading and expanding road networks, which encouraged further urbanization and personal vehicle use, that in turn led to additional traffic volumes and congestion. In effect, road upgrading policies have helped compound the challenges it sought to resolve, creating a negative and costly feedback loop . Public spending into road networks has also come at the expense of public transportation networks, which remained underfunded, inefficient, and unreliable. This, together with the region-wide policy of subsidizing car fuels – which is effectively a subsidy on private vehicle ownership – have further entrenched the dominance of private vehicle transportation over public transportation. These developments also had energy and environmental costs. In the nine years between 1999 and 2008, total energy use in transportation almost doubled , while the share of transportation in Middle East’s energy use grew from 23% to 31%. The region’s high proportion of energy use in transportation can be partly attributed to the lack of fuel efficiency standards and regulations, and the existence of an aging vehicle fleet in most of region (except for GCC countries) which, according to the Arab Environment Green Economy report, have an average age of 15 years. Yet this very fact has also contributed to the region having the highest transport sector greenhouse gas emissions per unit of GDP of any other region in the world, standing at 150 tons of CO2e per million dollar of GDP according to World Bank estimates. Sustainable transport is best defined as a system that allows the basic access and development needs to be met safely, promises equity for successive generations, operates fairly and efficiently, offers choice of transport mode, limits emissions and waste, and is affordable. Thus for a region such as the Middle East to achieve a true sustainable development, its first step should be to break out of the current road-dominated transportation system, and to adopt a multi-modal, efficient, and reliable public transportation network. Judging by the number of public transportation projects that are currently in the works across the GCC countries, one can confidently suggest that this change in vision seems to be taking place in one sub-region at least. 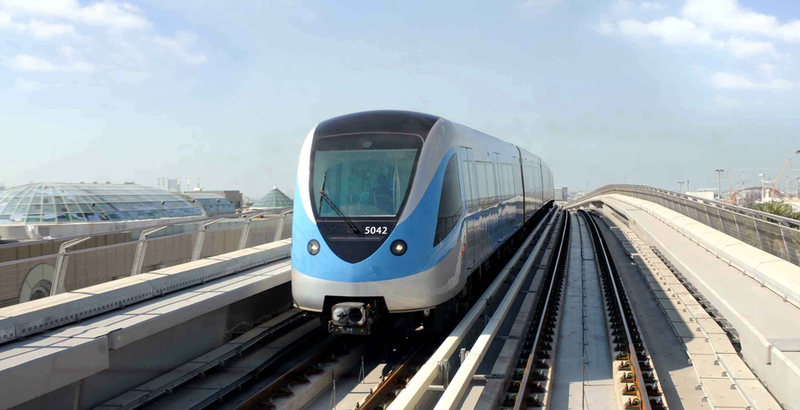 From GCC-wide projects such as the GCC railway (in planning) through national projects such as Etihad Rail in the UAE (Phase 1 under construction), to local projects such as Haramain Rail and Mecca Holy Sites Metro in Saudi Arabia (both under construction), the GCC appears to be in the beginnings of a major change to its transportation system. But plans for public transportation networks are not limited to the GCC. Across the Middle East and North Africa there are currently 28,200 kilometers of proposed and planned rail projects – almost doubling the existing network size- and approximately 2,000 kilometers of proposed and planned Metro, light rail, and monorail projects -a tenfold increase over the existing size. And while these projects vary in their degree of development and the likelihood of being implemented, the rising regional need by a population expected to to grow to 700 million by 2050, and by urbanization levels expected to reach 67% by 2030, places an added sense of urgency to the need to implement these projects at local, national, and regional levels. At the local level, Dubai is arguably home to the most advanced public transportation system in the region, and is home to the world’s longest fully automated metro system. Since its operation in 2009 the metro has been a success, carrying 250,00 people daily within two years of operation. The Dubai Metro has also become a node for an integrated multi-modal system, with a network of feeder buses serving local areas around the main metro stations, and bicycle parking spaces currently being fitted into the metro stations to encourage cycling to and from the stations. Figure 1: Dubai Metro. Source: Dubai Road and Transportation Authority (RTA). In addition, Dubai has developed an extensive network of bus routes covering even the most remote areas of the city. According to the Road and Transportation Authority (RTA), 1500 buses operate in Dubai at peak times, running on 79 different routes and carrying 310,000 passengers daily. This multi-modal network was accompanied by the development of an online public information tool named “Wojhati”, which helps users plan their journeys ahead of time across all public transportation networks and using real time information. The development of public transportation systems was accompanied by measures such as road tolls, designed to increase the cost of personal vehicle use relative to public transport alternatives. In 2007, Dubai was the first city in the region to introduce toll gate systems on some of its major roads. However, despite these initiatives by the authorities in Dubai, the RTA estimates that only 11% of Dubai residents used public transportation in 2010. A review of resons behind such a low rate of utilization revealed that many city residents were reluctant to use public transportation as long as it is not considerably cheaper than personal transportation. With energy subsidies maintaining petrol (gasoline) and diesel in the UAE artificially cheap, this economic balance is unlikely to happen soon. Personal transportation should therefore be discouraged by removing subsidies on fuel prices and introducing intelligent toll zones, if Dubai’s state-of-the-art infrastructure is to be fully utilized. Other opportunities for improving road transportation also exist through community planning and controlling traffic demand at the community level. Making sure that needed goods and services are catered for locally can go a long way in significantly reducing traffic demand. In dealing with many of the region’s common transportation challenges, the Dubai experience has a lot to teach other cities of the region. A future of sustainable transport in the region can be created by investing in a modern public transport systems and by carefully enacting the right policies to ensure a smooth transition away from private transportation. Karim Elgendy is a senior architect and sustainability consultant based in London. He is also the Founder and Coordinator of the Carboun Initiative. Wissam Yassine is a senior sustainability engineer and a Masters in Sustainability candidate at Harvard University Extension School. Wissam is also the UAE National Coordinator for the Carboun initiative. To discuss this article or the Road to Doha project, please join Carboun’s vibrant discussion group on Linkedin. For news and updates on sustainability from around the region, join Carboun’s Facebook page or follow its Twitter feed.